Indian Military : Service Benefits and Issues: Are we reading correctly ??? Another desperate political bluff to woo ESM voters during all important last spell of voting on 13 May and nothing more then that.Hope mature voters can read the real intention and not get mislead. (Note : Being a volatile issue, comments with political overtures would be strictly moderated. Please do not complain. Do you still think congress can ever do justice with army? what can the election commission do in such circumstances, navdeep? can it debar the congress candidates- that it will never do!!! the congress has played their cards beautifully, since a majority of the people who have access to the true picture is a miniscule, while the vast majority will get misled. To that extent whoever comes to power will have to take up this issue. If One rank One Pension- assured on the eve of last elections was thrown into the dustbin- there is greater possibility of repeat performance than any corrective action -if past be any guide? There to it than meets the eye. At first the congress went ahead with misinformation with smug belief that it won't be challenged as well as the consideration that it has got Navin Chawla sitting as its very own man as CEC. It did not anticipate the rebuff. The advert appearing again in Punjab Kesari is nothing but shrewd misinformation campaign. Defence personnel, serving and retired alike will do well to kick such a campaign in the shin and put the party practicing such things in its "proper place". The damage is done. Gullible ex-fauji's with no access to net etc will fall for it and get misled. But what else to expect from 'Con'gress. "The intention obviously is to woo the defence community of 14 lakh serving and 23 lakh retired military personnel, which expands into a sizable votebank of around 1.5 crore people if family members are taken into account." The punchline in the TOI report posted by Navdeep. So, we are a 'vote-bank' after all. I do not know whether any one has calculated the financial impact of OROP. We have to note that rank does not mean only our rank. It will have to be extended to all central and state staff as they will fight for it.It will also have to take into a/c extra pension already being given to 80+. We cant just say we dont care where from the funds come.BJP has promised also for votes and congress has tried to create similar noises. The moment they differentiate between one batch and another or one service and another there will be agitation. So let us be practial. No scheme of OROP is likely to be satisfactory.Election promises are not promissary notes! if ur definition of practicality means not asking for OROP then let us be non-practical. the supreme cdr(president) of armed forces id getting orop, all IAS r getting it since they all reach a minimum bench mark and for that bench mark the pension is uniform then y not armed forces, even all ministers and mla r getting it. Another option with govt is to withdraw it from them too!!!! R THEY CAPABLE OF DOING IT??? I would like Anon who responded to my comments or Navdeep to clarify for my knowledge the following. Does a pre 2006 retiree of IAS below secretary level or below DGP level in IPS and similar position in other central services, get the Minm of new PB4 or HAG scale (like us) or does he also get refixed based on the years spent in that scale? If yes then I stand corrected. However remarks about implementability still are valid. A poll gimmick thats all servicemen/women always have and will keeping fighting their own battle with or without political patronage. I am serving NCO of Indian Army and inhabitant of Vill- Mitoora, post Meera Nagar, Teh/PS mahmudabad Distt- Sitapur (U.P). Presently I am serving with 6 Mtn DOU. Your guide lines are very helpful for serving as well as retd army personal. You are requested to please publish your web site in monthly Baat Cheet. There is no news on Col TS at 21 yrs post reduction in col substantive from 20 to 15 yrs. Are the services HQ intiating reduction in length of service for Col TS? Maj Navdeep pls keep the matter alive by writing on the subject otherwise it may die its natural death.There are many listeners to your views in tht corridors of power. It is a political gimmick. Either way the Congress and UPA Govt is to be blamed. Punjab kesari would not have advertised on behalf of congress on their own. surely somebody from the govt has inserted that Advertisement. It is not easy to find out who was that official. Cabinet secretary, Chandrasekar has now denied setting up a Committee . How did this Advertisement come up then ? Is n't it the job of Election commission to investigate further in the matter and nail the lie by the Cabinet secretary. After all, he has been the root cause and a major contributor to all anomolies in sixth pay commission implementation for Armed forces. I won't be surprised if he is telling a lie to the election commisssion. If, however, he is not telling a lie, congress must be pulled up for giving False promises on OROP during elections and violating moral code of conduct. i wonder with Navin chawla around, whether such an investigation would happen at all. 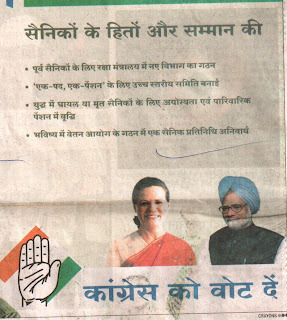 Just to add to what you had written about the congress advt. With Mr Manish Tiwari having been elected from Ludhiana, it will be worthwhile chasing him to take up the issue of OROP. It was Mr Tiwari, who had told the voters that 'congress believes in OROP'.